I know we have some men readers out there and this one is for you! I have found a great website full of beautiful handmade jewelry that is a perfect gift for your wife and mother of your children. The company I am talking about is Jinja Jewlery. All Jinja Jewlery is handmade. 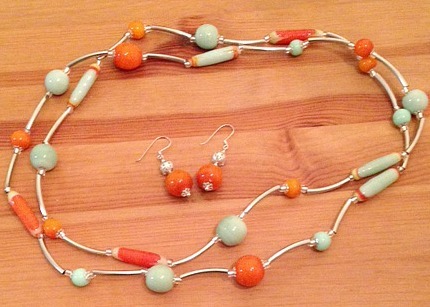 They use both coral and silver to make their beautiful creations. Above is one of my favorite pieces of jewelry that Jinja makes. It is one pair of their earrings and a matching necklace. What is great about the earrings is that they are made out of sterling silver. This is good especially for me because recently my ears have been very sensitive so when I wear cheap earrings that are not made out of sterling silver. They start to hurt but with these earrings they were so easy to put in and didn’t hurt at all. This is true about all of Jinja’s earrings, they are all made out of sterling silver so even the most sensitive ears can wear them. The necklace above is very light and when I am wearing it I barley notice it is there. I also like how it can be worn long or you can double it around your neck for a shorter necklace. Another type of jewelry that Jinja carries are their twist bracelets. They come in many different colors, my personal favorite being some of the beautiful blue coral that they use in some of their bracelets. I tried the bracelet above on and for me I wasn’t a big fan but I don’t ever wear bracelets and usually don’t like anything around my wrists so besides that I thought it was a great bracelet. I did try it on my 2 year old daughter and it fit both her and myself so there is no need to worry if it will fit the person you are buying this for. The last three products from Jinja Jewlery that I got to try out were three of their pendants, they have a lot of beautiful pendants that you can choose from on their website and each style comes in different colors. They didn’t come with chains so what I am assuming is that any pendant you order will not come with chains either, but these pendants should work with any silver chain you choose or might even have already at home. 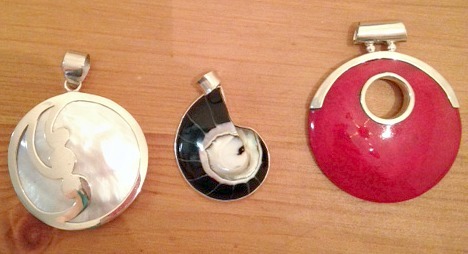 Out of these pendants, my favorite one was the one on the left. It is their sterling silver and mother of pearl pendant. This would be a perfect gift to any mother this upcoming holiday season. They also have other products that are geared toward mothers and children and that is one of the reasons their particular jewelry company caught my eye. I Love My Kids Blog is hosting a Jinja Jewlery giveaway on the blog for one of my favorite of their products, the mother of pearl pendant! To enter the giveaway fill out at least one of the entries in the rafflecopter below. The giveaway is open to those who are 18+ and in the US only. The giveaway ends 11/20 at 11:59 pm EST and the winner will be contacted by email and will have 24 hours to respond or a new winner will be chosen. Good luck! Congrats to our winner Kimberley Thomas! Kimberley, you have been emailed and have 24 hours to reply or a new winner will be chosen! *I received samples of the products mentioned above for free to facilitate this post. All opinions are mine. My favorite is the Mother of Pearl pendant because it would really go with any outfit and could be worn every day. I love their jinja bracelet in sterling silver. It is so stylish. I love the necklace and earring set pictured above. I love that the necklace can be worn long or short. I also love that their jewelry is sterling silver since I am allergic to nickel and gold. I love the Sterling Silver Mother of Pearl necklace the best, would love to win it! I love the Jinja necklace that is short with 40mm black coral pendant with lava rock and crystal beads. I think it’s beautiful. I like the jinja necklace with the yellow stones. It makes me happy! I like the jinja necklace with the yellow stones. It makes me happy because of the fun color! I like the jinja necklace with the yellow stones. It makes me happy because of the fun color! Who doesn’t need some yellow in their life? I like any of the bracelets. Thanks for this chance to win! I really like the Jinja Twist Bracelet with the black lava beads. I love the Sterling Silver frangipani ring! I am Hawaiian, and the frangipani is traditionally used in Hawaiian jewelry and scents! I love the mother-of-pearl pendant – it would look beautiful with most any outfit. I also like the red coral shell pendant – it would go with fewer things, but is stunning! twist bracelet, red I love the look and color of it. 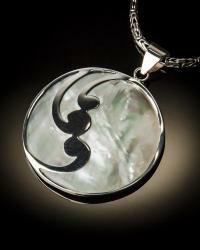 The mother of pearl pendant is beautiful and something I would wear! ELE-ER-Blue Topaz-Sm AERxxx because they look perfect for my daughter. i love the Jinja ring SKU: R-09031Red Coral. I love the color & style. Very original & pretty! I like the Jinga Twist Bracelets. I like the colorful beads and that one size fits all. I really like the coral jewelry. This would be a great gift for any woman in your life. I love the Yin Yang Pendant in black shell. It’s beautiful and would go with most anything. I love the jinga ring in Garnet. Its super cute and I like the way it looks. I am absolutely LOVING that mother if pearl pendant! Would match a qatch I have and even have a chain I could use for it! Thanks for the chance to win! I really love the chunky red corral ring–so pretty and unique! I love their jinja bracelet in sterling silver. Beautiful! 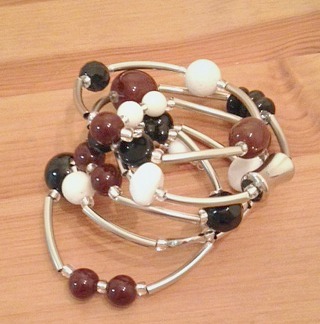 I like the clasp on this bracelet and the stone choices. I like the Sterling Silver Red Coral Flower Pendant its so vibrant with the red coral colors ,certainly could wear it year round season after season & always be styling.Really like the look & color of the jewelry looks well made . I have a taste for silver and amethyst, so the sterling silver ring with mixed gemstones (amethyst, garnet and blue topaz 9.4gms) caught my eye. I like the Mabe pearl bracelet, because it lovely and could be worn dressy or casual. I love the Malachite Ring,as it would look great with my green jacket. I love the Jinja silver bracelet with the flowers. It is just really pretty. Stainless steel tube bead necklace with assorted blue coral beads and rhodium plated beads.. It would look wonderful with so many of my outfits. I love the Sterling Silver 38mm Round spiral dark pendant!! My favorite is the SKU: P-03607-Aqua shell because it’s very tropical! I love it & I’m so happy I won !! Thanks Again ~it is beautiful! !